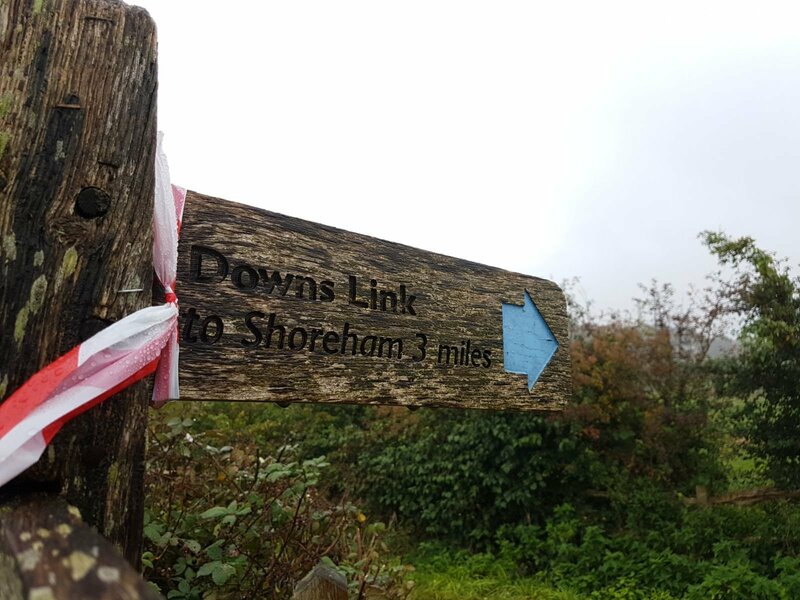 The Downslink is billed as a nice friendly intro to ultras, and it’s put on by the dream team that are Sussex Trail Events. Whenever anyone asks me for race recommendations I can’t stop raving about these, sometimes brutal, but incredibly rewarding events. So it seemed only natural that my leap in to ultras would take place once again with this very familiar lot, along this very familiar route. The route takes you along the Downslink from Surrey to Shoreham, a mostly flat old railway line that links the North Downs to the South. Everyone I know who has run it, has a real love affair with it, and it seemed like a safe place to up my distance on the road to 50 and beyond. I started with nerves a plenty and as such it took me longer than normal to settle in to a rhythm, this was made harder by the ground underfoot which was pretty tricky. The mud had been nicely soaked by a few days of downpours and then churned up and spat out by the many people/dogs/horses/bikes out for their weekend activities. It made a generally flat route into an energy sapping route quite early on. I obviously didn’t know this at the time! I thought how fun it was, I loved hopping and skipping over tree branches and puddles, getting splashed and thinking what a great day out on the trails it was. There were some pretty hairy stretches where I was skating rather than running but that’s all part of the fun right? I chatted to friends old and new and I thought maybe I could do this thing as my pace picked up and I settled in to a long day. My strategy had been to run between 9:30 and 10:30 for the whole thing. In the good moments I allowed myself to push it and in the bad I’d have a little space and time to play with. Aid station 1 and 2 came and I felt good, I would say hey to my family, stock up and move on, but by the time 3 came along at 21 miles I was massively struggling. What had happened? I’m the woman who has been knocking out marathons for fun this year and now suddenly I’m not even at marathon distance and my legs feel like they want to quit, why? Well I’m fairly certain that was down to my naivety, my haphazard pacing, and my hop skip and jump first 15 miles, but honestly who knows? Not an excuse in any shape but my pack had been a major issue, although I’d run with it in training, I’d always just used the bottles up front. I’d decided last minute to chuck the water reservoir in the back panicking that I’d need more fluid. I didn’t! Consequently my back was well and truly rubbed raw. At the aid station I had such great support, I talked about how I wanted to quit and they told me rightfully that I couldn’t. I started to tell myself that I just needed to get to the next aid station and then I would’ve completed my 9th Marathon this year, and then maybe I could quit. This is a dangerous mindset, and I’ve never been so close to throwing in the towel. I ditched my water reservoir and ran on in discomfort. Along the next stretch my mind was well and truly struggling. I decided to implore the run to this location and then your treat can be a brisk walk, a sip of water/coke and a sweet treat. Luckily at this point Jen found me. We’d started together but in my “I’m such a great runner” naivety we’d separated. She asked if I was struggling and I said shamefully “yes” feeling like a total fraud. She then uttered the only words that could have lifted me “me too”. I wasn’t happy she was struggling, I was happy that someone was confirming to me that this was a tough day, a tough thing to do. I’d been alone for so long thinking that everyone else had probably finished and was off planning their next ultra-adventure. I hadn’t let myself believe that actually this was a really tough thing to do on a really tough day. I asked if I could stick with her for a bit, and that bit turned in to the remaining 15 miles. 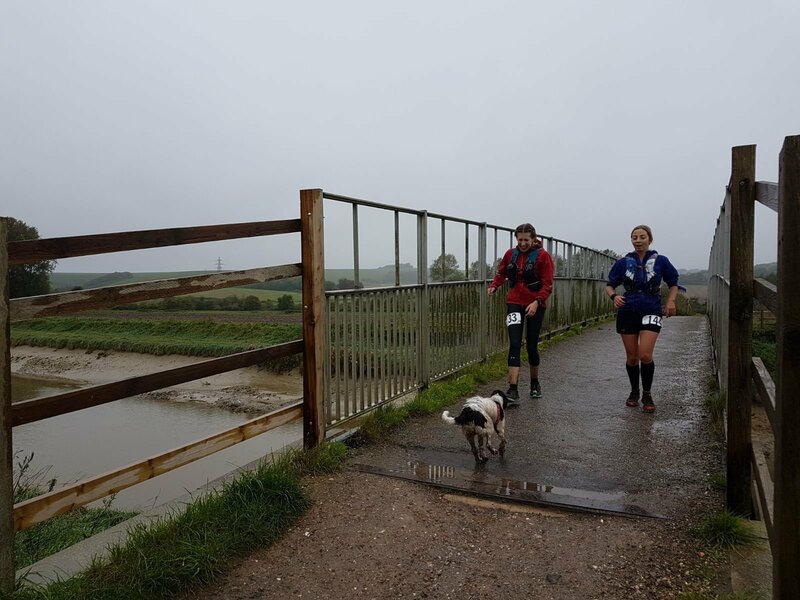 As we ran along the now relentless path the heavens opened, of course they did, it’s me running towards and along the Adur, I’m destined to never do this on a favourable day. We were both pretty desperate to get to the next aid station and see our families. We were emotional in the run up and I hugged my husband and cried, I didn’t feel terrible, I hurt and my body wanted to stop, but I cried because now I knew I wouldn’t quit, I couldn’t quit. I had a friend and we were going to finish this thing. Pacing continued to be a bit all over, we’d get excited and speed up and then I’d struggle for a bit and slow down. We still had a half marathon to go and although that seems relatively short when you’ve already run so far, it’s a long long long way to go on tired legs. The headwind was picking up and the rain got stronger, more lovely friends cropped up on route at random spots and the boost they gave us was unreal. As we started to get on familiar ground, we kept giving each other the boost that was needed. Jen will deny this I’m sure, but she was the stronger runner and kept me going more times than I care to admit. I was covered in mud and felt both physically and mentally bruised. I tried to rally as much as I could for her and for me, but I’m not sure I did much of either. I wish I could put my finger on what went wrong; the weather, the terrain, the fuelling, my pack, pacing… pick any or all of the above! My sub 6:30 time slipped away, but I did not care a single ounce, we would finish under 7 hours and more important we would just finish. 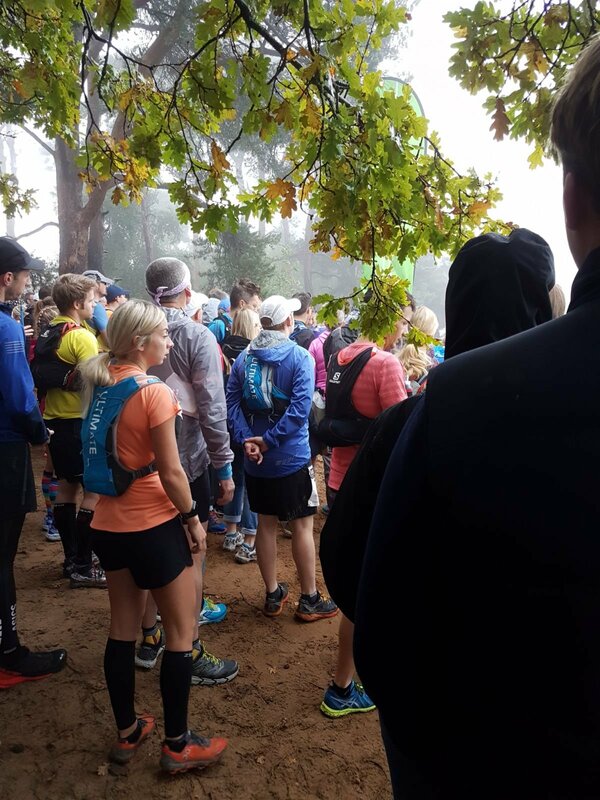 I honestly believe that anyone who makes it to the start line of an ultra is incredible and if you get to the finish, then you’re a total queen! And yes i’m trying to remind myself of this often as my mind dips in to the inevitable you should have run it better/smarter territory. We came to the last bridge, the final run along the rickety paving that I’d run so many times before, it was pretty emotional. This was my impossible, the thing that just this morning I didn’t think I could do, the thing I’d been dreaming about and planning for, and it was happening, we were doing it. In that moment it was probably the first time I’d allowed myself to believe it. The headwind was ridiculous at this point as you’re completely exposed. I had to laugh to myself because even after 37 gruelling miles, they couldn’t just let you have it, you still had to really really work for it! As we saw the finish we picked up the pace, grabbed hands and ran across the line in the most ULTRA way we could. I’d love to tell you how beautiful the course was, but on a day like this it really is relentless. I run it often and know it well, so I can safely say that on a good day this would have been a totally different race, but on a bad day… I can tell you this though, in the rare moments I looked up I saw some pretty nice fields with sheep in, and in the moments I looked down, I felt lucky that we live in a place that has so many beautiful trails to explore. 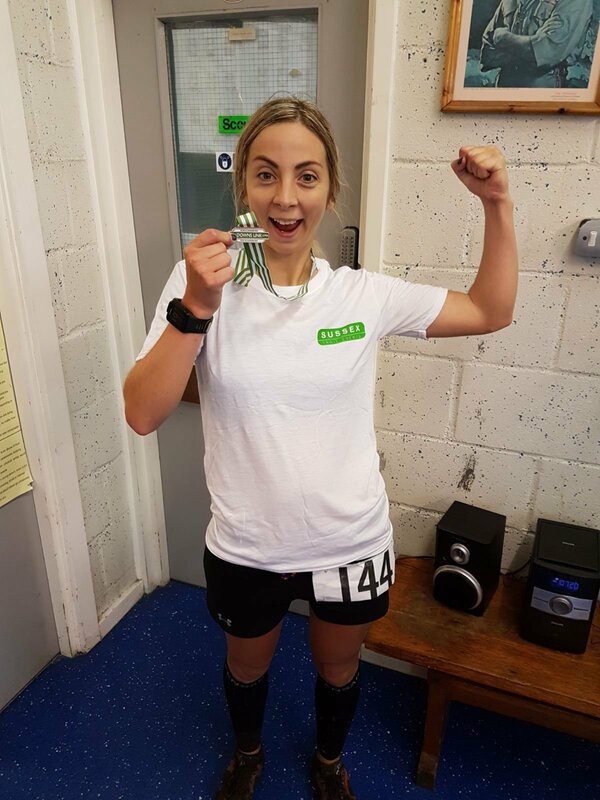 The other must say is that at any Sussex Trail Event you will be supported by the most delightful Marshals, delicious food, and incredible runners with incredible stories. I have never ever regretted a day out with this lot, and I’ve been there for some pretty grim days (and nights). Thank you to them all, they make this crazy thing we love to do possible. I have so many thoughts and feelings, and I’m certain I’ve not done any of this justice with my rather garbled words. There are so many things I’m not sure about right now, but the one thing that is sitting quite comfortably is the notion that even when I feel so strongly that I can’t, I can! This is not my end of ultra-running, it is very surely the beginning. Would I say I’m in love with ultras? Right now, no. I am however in love with running and with learning about what I’m capable of. I have learned an incredible amount and am certain I could quite happily spend the rest of my life trying to figure out the rest. I can work towards the future now knowing that on a bad ultra day, I can get to the end (if I have amazing people by my side and a little bit of grit in my heart). Thanks to John Lavis and Emma Spicer-Howard for the snaps! I wouldn’t have made it through this thing without quite a lot of people, but I definitely would have struggled a lot more in those final miles without the lovely company and support of Jen. I asked her for a charity nomination as my way of saying thank you. As always my race fees go to them. This is a gift from me, as a thank you to running and a way to raise some awareness and maybe some karma points. It’s your call if you want to join in. they’re all listed in the race recaps. So this one’s for you Jen and I’m sending my donation to CRY – Cardiac Risk in the Young. They do some incredible work to prevent young sudden cardiac death (YSCD), and weirdly having found out this year that I’ve got a heart condition that I’ve most likely had since birth, it seems weirdly fitting for me too. Find out more and donate here. As always there are so many ways you can get involved with charities that are not monetary, so if this one (or any of them) is close to you then why not see how you can help.